Denmark legend Peter Schmeichel has aimed a number of barbs at Roy Keane, Martin O'Neill's tactics and the Irish side that performed heroics under Jack Charlton. When it comes to direct questions about his old sparring partner Keane, however, Schmeichel clams up, unwilling to add further fuel to the fire stirred by the Ireland assistant boss earlier in the week - relations have been strained since the pair had an infamous late-night skirmish on a pre-season tour in 1998. Asked if he was surprised that Keane was operating as a No 2 given his celebrated leadership qualities so evident in their Old Trafford days, Schmeichel responded curtly: "I have absolutely no answer to that because why would I be surprised? I'm surprised he is employed by the FAI. Maybe they kissed and made up. I don't know." The implication was that Keane and Schmeichel have never kissed and made up; and the Dane continued in mischievous vein. Asked how tonight's teams compare to the star-studded Irish and Danish sides that clashed in the World Cup '94 qualifiers, drawing twice, Schmeichel was unequivocal. "They don't," he said, before aiming a dig at the genealogical make-up of Jack Charlton's side. "Half of them weren't even Irish, you know? They knew somebody who was Irish." His analysis of the play-off includes another barb, albeit one that will offer further succour to Ireland fans: "Traditionally we struggle with teams that park the bus." Christian Eriksen is widely acknowledged as the biggest threat to Ireland's World Cup hopes, but according to Schmeichel, the Tottenham play-maker has "disappeared" in 60 of his 73 internationals. So that's the good news: the only world-class player on either side in tomorrow night's play-off first leg delivers for his country less than 20pc of the time. The bad news is that Schmeichel reckons that most of Eriksen's influential displays have come since Age Hareide took over as Denmark manager in March last year. Asked if he was worried that Eriksen could be nullified by Ireland, Manchester United legend Schmeichel said: "Christian has played about 75 times for Denmark and that's happened about 60 times. He's just disappeared. "But that was under a different manager, a different system. He has been played out of position and has been dictated to play in a certain way, which has been very difficult for him. "But now it's different, now Christian is more free in his role. He can roam around and play his game, and that's worked really well for Christian in the last four months." In those last four months, Denmark won three successive games - including a 4-0 thrashing of pool winners Poland, ranked No 6 in the world - to secure a play-off berth, before a dead-rubber draw with Romania. Eriksen scored in all four games to bring his pool tally to eight. "That was our best game for many years," says Schmeichel of the Poland result, explaining that the Danes' renaissance after several years in the doldrums stems from a return to a more traditional, direct style. Schmeichel was just as impressed with the 1-0 win away to Montenegro, who had stunned the Danes in Copenhagen earlier in the campaign. "We had the concentration, determination and grit - things we hadn't seen in a Danish team for many years," he said. Those recent results have left the Danes confident of overcoming an Irish side with few individuals to strike fear into opposition hearts. Schmeichel, though, is wary of underestimating a side with so many players who ply their trade in the second tier of English football. The former goalkeeper, a key member of the Danish side that won the European Championship in 1992, and father of current No 1 Kasper, feels that, Eriksen excepted, the sides are "very, very similar". "My worry is that some of the Danish players don't know how good the Championship is," he said. "They could go out there thinking 'they only play in the second tier of English football'. I hope it doesn't happen - we've got a lot of players to remind everyone else that the Championship is the No 5 league in the world. "I really don't think the Irish team is weak. They have incredible mental strength." That resilience, he agrees, derives at least in part from the managerial duo of Martin O'Neill and Roy Keane, whose experience of big-game situations could be a factor tonight. 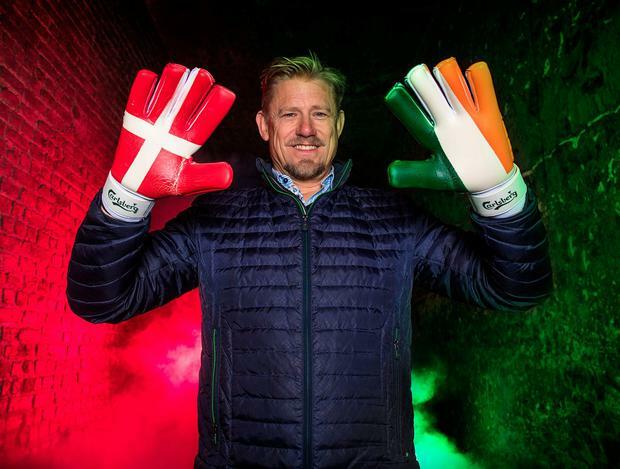 Peter Schmeichel was in Dublin to announce Carlsberg's plan to give Ireland fans in Copenhagen a free pass to the Carlsberg Experience and a free pint.